I had an opportunity to see first hand, the work of the Yarra Valley Tourist Railway Society out at Healesville last weekend. The volunteer railway have done a tremendous job restoring the Walker RM22, an ex Victorian Railways rail-motor, not to mention the great restoration works on the track and bridges too. Pictured left to right: Adam Taylor – Driver and Committee member, Cr Samantha Dunn – Lyster Ward, Brett Whelan – Vice President and Brett Morton – President with the beautifully restored RM22 in the background. YVTR are currently testing the RM22 which runs along the line from Healesville for about 4.5 kms towards Tarrawarra over the Watts River and through the tunnel. The group plans to officially launch the RM22 in June and make it available to the public for train rides. 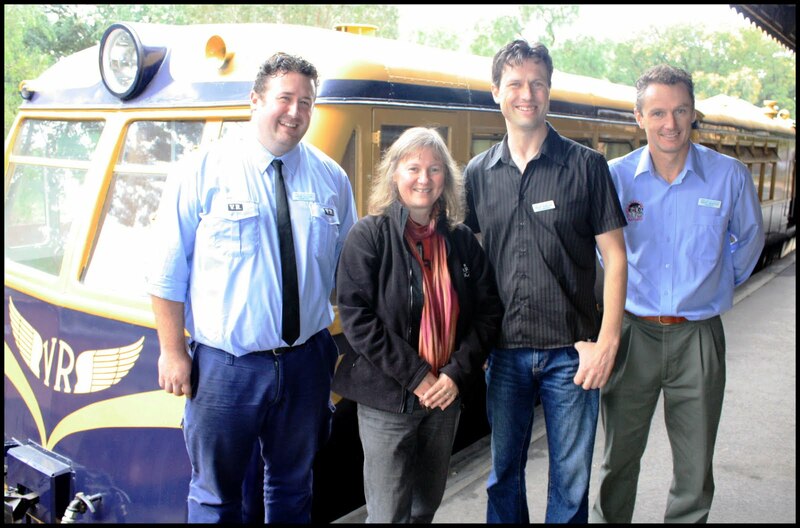 The YVTR volunteers are an impressive bunch, passionate about their railway, they proudly acknowledge the many hours volunteers have put towards the railway restoration and the fact that they have the youngest volunteer base of any tourist railway in Victoria. They have terrific support from a huge range of local businesses, the Department of Transport and local community members. The YVTRS welcomes anyone who is interested in participating in various projects to restore the Yarra Valley Railway to be Australia's Premier Broad Gauge Railway. If you are interested in finding out more contact info@yarravalleyrailway.org.au or click here.